Patented WELLAIR air and moisture separator, is a low cost 100% reliable way to keep the compressed air being used by your CNC Machine clean and dry. 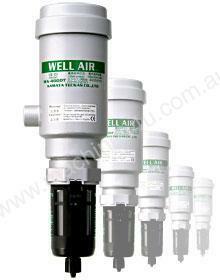 WELLAIR is easy to install and comes complete with a mounting bracket. Unlike Line Filters and other types of filtering systems, the WELLAIR 's performance remains constant regardless of the flow rate change, and best of all it requires no maitenance, and will not deteriorate over time. Even if you have line filters that require servicing to drain off collected water, WELLAIR will protect your investment even if maintenance to the line fiter has been overlooked. 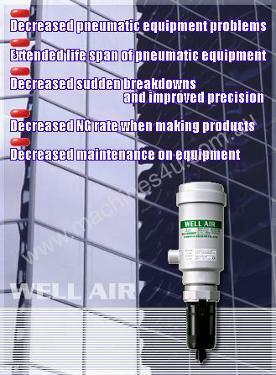 WELLAIR is suitable for any equipment that uses compressed air, and selection criteria is based on actual flow rate of each piece of equipment.